For other uses, see Round Table (disambiguation). Though the Round Table is not mentioned in the earliest accounts, tales of Arthur having a marvelous court made up of many prominent warriors is ancient. Geoffrey of Monmouth, in his Historia Regum Britanniae (composed c. 1136) says that, after establishing peace throughout Britain, Arthur "increased his personal entourage by inviting very distinguished men from far-distant kingdoms to join it." The code of chivalry so important in later medieval romance figures in as well, as Geoffrey says Arthur established "such a code of courtliness in his household that he inspired peoples living far away to imitate him." Arthur's court was well known to Welsh storytellers; in the romance Culhwch and Olwen, the protagonist Culhwch invokes the names of 225 individuals affiliated with Arthur. The fame of Arthur's entourage became so prominent in Welsh tradition that in the later additions to the Welsh Triads, the formula tying named individuals to "Arthur's Court" in the triad titles began to supersede the older "Island of Britain" formula. Though the code of chivalry crucial to later continental romances dealing with the Round Table is mostly absent from the Welsh material, some passages of Culhwch and Olwen seem to reference it. For instance, Arthur explains the ethos of his court, saying "[w]e are nobles as long as we are sought out: the greater the bounty we may give, the greater our nobility, fame and honour." Though no Round Table appears in the early Welsh texts, Arthur is associated with various items of household furniture. The earliest of these is Saint Carannog's mystical floating altar in that saint's 12th century Vita. In the story Arthur has found the altar and tries unsuccessfully to use it as a table; he returns it to Carannog in exchange for the saint ridding the land of a meddlesome dragon. Elements of Arthur's household figure into local topographical folklore throughout Britain as early as the early 12th century, with various landmarks being named "Arthur's Seat", "Arthur's Oven", and "Arthur's Bed-chamber". A henge at Eamont Bridge near Penrith, Cumbria is known as "King Arthur's Round Table". The still-visible Roman amphitheatre at Caerleon has been associated with the Round Table, and it has been suggested as a possible source for the legend. Following archaeological discoveries at the Roman ruins in Chester, some writers suggested that the Chester Roman Amphitheatre was the true prototype of the Round Table; however, the English Heritage Commission, acting as consultants to a History Channel documentary in which the claim was made, stated that there was no archaeological basis to the story. The Round Table first appeared in Wace's Roman de Brut, a Norman language adaptation of Geoffrey's Historia finished in 1155. Wace says Arthur created the Round Table to prevent quarrels among his barons, none of whom would accept a lower place than the others. Layamon added to the story when he adapted Wace's work into the Middle English Brut in the early 13th century, saying that the quarrel between Arthur's vassals led to violence at a Yuletide feast. In response, a Cornish carpenter built an enormous but easily transportable Round Table to prevent further dispute. Wace claims he was not the source of the Round Table; both he and Layamon credited it instead to the Bretons. Some scholars have doubted this claim, while others believe it may be true. There is some similarity between the chroniclers' description of the Round Table and a custom recorded in Celtic stories, in which warriors sit in a circle around the king or lead warrior, in some cases feuding over the order of precedence as in Layamon. There is a possibility that Wace, contrary to his own claims, derived Arthur's round table not from any Breton source, but rather from medieval biographies of Charlemagne—notably Einhard's Vita Caroli and Notker the Stammerer's De Carolo Magno—in which the king is said to have possessed a round table decorated with a map of Rome. The Round Table takes on new dimensions in the romances of the late 12th and early 13th century, where it becomes a symbol of the famed order of chivalry which flourishes under Arthur. 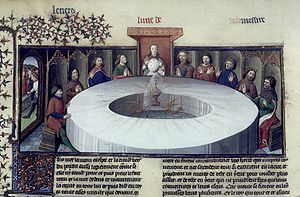 In Robert de Boron's Merlin, written around the 1190s, the magician Merlin creates the Round Table in imitation of the table of the Last Supper and of Joseph of Arimathea's Holy Grail table. This table, here made for Arthur's father Uther Pendragon rather than Arthur himself, has twelve seats and one empty place to mark the betrayal of Judas. This seat must remain empty until the coming of the knight who will achieve the Grail. The Didot Perceval, a prose continuation of Robert's work, takes up the story, and the knight Percival sits in the seat and initiates the Grail quest. The prose cycles of the 13th century, the Lancelot-Grail cycle and the Post-Vulgate Cycle, further adapt the chivalric attributes of the Round Table. Here it is the perfect knight Galahad, rather than Percival, who assumes the empty seat, now called the Siege Perilous. Galahad's arrival marks the start of the Grail quest as well as the end of the Arthurian era. In these works the Round Table is kept by King Leodegrance of Cameliard after Uther's death; Arthur inherits it when he marries Leodegrance's daughter Guinevere. Other versions treat the Round Table differently, for instance Arthurian works from Italy like La Tavola Ritonda (The Round Table) often distinguish between the "Old Table" of Uther's time and Arthur's "New Table". During the Middle Ages, festivals called Round Tables were celebrated throughout Europe in imitation of Arthur's court. These events featured jousting, dancing, and feasting, and in some cases attending knights assumed the identities of Arthur's entourage. The artefact known as the "Winchester Round Table", a large tabletop hanging in Winchester Castle bearing the names of various knights of Arthur's court, was probably created for a Round Table tournament. The current paintwork is late; it was done by order of Henry VIII of England for Holy Roman Emperor Charles V's 1522 state visit, and depicts Henry himself sitting in Arthur's seat above a Tudor rose. The table itself is considerably older; dendrochronology calculates the date of construction to 1250–1280—during the reign of Edward I—using timber from store felled over a period of years. Edward was an Arthurian enthusiast who attended at least five Round Tables and hosted one himself in 1299, which may have been the occasion for the creation of the Winchester Round Table. Martin Biddle, from an examination of Edward's financial accounts, links it instead with a tournament Edward held near Winchester on 20 April 1290, to mark the betrothal of one of his daughters. ^ a b Geoffrey, p. 222. ^ Ottaway, Patrick; Michael Cyprien (1987). A traveller's guide to Roman Britain. Historical Times. p. 35. ISBN 978-0-918678-19-5. ^ Castleden, Rodney (1999). King Arthur: The Truth Behind the Legend. Routledge. p. 148. ISBN 978-0-415-19575-1. ^ Evans, Martin (July 11, 2010). "Historians locate King Arthur's Round Table". www.telegraph.co.uk. Retrieved July 15, 2010. ^ a b c d e f Kibler, William W. (1991). "Round Table." In Lacy, Norris J. (Ed. ), The New Arthurian Encyclopaedia, p. 391. New York: Garland. ISBN 0-8240-4377-4. ^ Walters, Lori J., "Re-examining Wace's Round Table", in: Keith Busby, Christopher Kleinhenz (eds. ), Courtly arts and the art of courtliness, DS Brewer, 2006, p. 721-744. ^ Hoffman, Donald L. (1991). "Tavola Ritonda." In Lacy, Norris J. (Ed. ), The New Arthurian Encyclopedia, p. 444. New York: Garland. ISBN 0-8240-4377-4. ^ Lacy, Norris J. (1991). "Round Tables." In Lacy, Norris J. (Ed. ), The New Arthurian Encyclopedia, p. 391. New York: Garland. ISBN 0-8240-4377-4. ^ a b Ashe, Geoffrey (1991). "Winchester." In Lacy, Norris J. (Ed. ), The New Arthurian Encyclopedia, pp. 518–519. New York: Garland. ISBN 0-8240-4377-4. ^ Biddle, Martin (2000). King Arthur's Round Table: an archaeological investigation. Woodbridge, England: Boydell and Brewer. p. 182. ISBN 0-85115-626-6. .
Bromwich, Rachel (2006). Trioedd Ynys Prydein: The Triads of the Island of Britain. University Of Wales Press. ISBN 0-7083-1386-8. Geoffrey of Monmouth; Thorpe, Lewis (1988). The History of the Kings of Britain. New York: Penguin. ISBN 0-14-044170-0. Loomis, Roger S. (1959). "Arthurian Influence on Sport and Spectacle". Arthurian Literature in the Middle Ages. Oxford. Padel, O. J. (2000). Arthur in Medieval Welsh Literature. University of Wales Press. ISBN 0-7083-1689-1. Rouse, Robert; and Cory Rushton (2005). The Medieval Quest for Arthur. Tempus, Stroud. ISBN 0-7524-3343-1. Thomas, Charles (1953). "Folklore from a Northern Henge Monument". Folklore. 64 (3): 427–429. doi:10.1080/0015587x.1953.9717383. JSTOR 1256826. Wikimedia Commons has media related to Round Table.